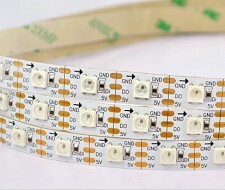 Individually addressable LEDs on a flexible strip. Each 5050 LED incorporates a WS2812B intelligent control processor which allows the tape to be cut at every LED for precise installation. Creates stunning effects and suitable for a multitude of installations. Sold on 5m reels with 60 LED/m. Runs 2 x 5m digital tape.